Went to the store today. 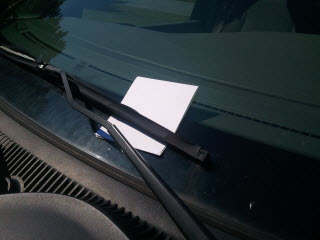 When I came back to my van, I found a note on my windshield. As I walked the note to the trash can, I started seething. How dare anyone write a note like that! Especially when I was right in the center of the painted lines of my spot! I wasn’t sure who’d put the note there, but I started trying to figure out who was to blame. A man is angry because he got a late start for the office so he drives like a maniac and cuts off Frank. This ticks Frank off so when he gets to his office, he snaps at his assistant about a report at that is late. His assistant is now upset that the person responsible for the report, Joe, is making her look bad to her boss so when she calls Joe, she takes out her anger on him. Joe gets the report but is upset all day. He’s still upset when he gets home. His cat, who’s has nothing to do with Joe’s day, bumps the door and Joe, in his anger, ends up kicking the cat. The cat had nothing to do with Joe’s bad day, or the assistant’s stress, or Frank’s being upset, or the first guys getting a late start to the day. But the cat takes the brunt of that frustration. Zig’s point was that at any point in the chain of events each of the people had a choice over their attitude. They could choose to react in kind, or respond more positively. Each of us have the choice to not kick the cat. To not pass on the negative crap we get by hanging around people like us. Obviously this lady was having a rough day. I’ve never received a note like that. Think of the effort involved in finding the Human Society note pad, finding my license plate, and hand writing such a venomous note. She must’ve been fit to be tied. And really…it had nothing to do with me. Sure, it was wrong. But did my kids really need me to lash out at them as I’d been lashed out at? Obviously not. So I tried making up a story in order to fight of the anger that kept trying to get me. I decided it was the woman who’d parked into my space and went into the cell phone store. I know how frustrating that can be. And I tried imagining what happened to her on the way to the store and why those people did what they’d done. Because, her anger really had nothing to do with me. And I didn’t want to kick the cat. Next Next post: What a cool Kingdom use of Google+ Hangouts!